My cousin Don had retired only two weeks earlier after more than 30yrs in the disk drive industry. It wasn't exactly by choice - he actually likes working a great deal - but a recent merger had left no room for his VP of Engineering position and they could not find a suitable position in the new company to satisfy him. He's now "trying out" retirement, seeing if this lifestyle would suit him. Now approaching 10yrs since my own retirement, I felt it was my job to help show him he didn't have to get bored and besides, I need more retired friends. He's a pretty active guy the same age as myself so we decided on a mountain bike ride in Morgan Territory OSP, not far from his home in Pleasanton. As one might expect on a Tuesday morning, the place was nearly deserted, only a few other park users we'd see in the three or four hours we were there. Lying southeast of the much more reknowned Mt. Diablo State Park, this regional park is a collection of older ranches composed of oak-studded grassy hills with some steep trails up and down the various drainages. In summertime the place is brown, drab and blazing hot, but in late February it is a vivid green of lush grasses, sometimes muddy trails and no trace of the persistent drought facing the state. 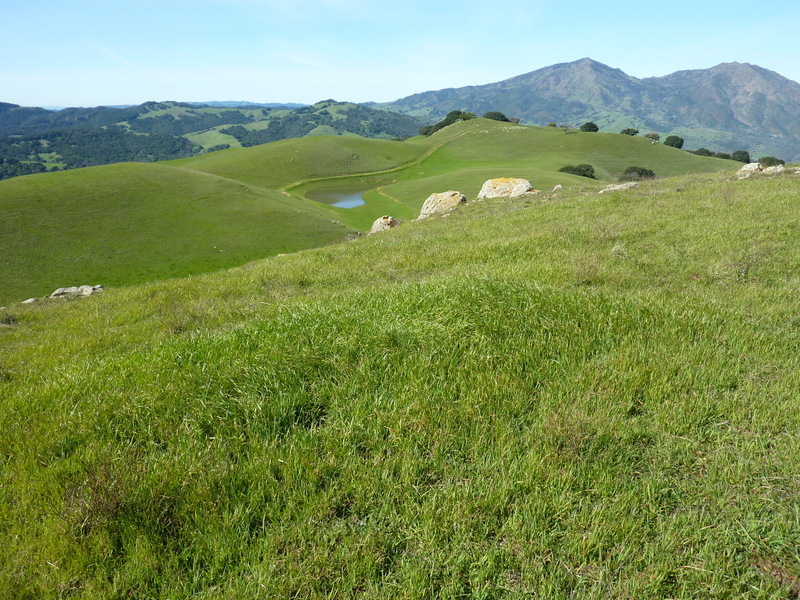 Because I'm GOOCD (Goal-Oriented OCD) I needed a summit to target, which in fact is what brought us to Morgan Territory. While there are no summits with 300ft of prominence inside the park, there are several just outside, Peak 2,139ft being one of them. Located at the north end of the park, the area sees little human traffic both inside and outside the park boundary. Cows were happily grazing on both sides, not much minding our presence as we rode by. The only way one knows you're leaving the park is that the gates are now padlocked. We lifted the bikes over the first locked gate, but upon reaching a second one we parked them and walked the remaining few hundred yards to the summit. There is a VABM located near the summit about 50yds to the south of the highpoint. I found one of the reference marks but was unable to locate the benchmark under all the tall grass after a cursory search. The summit offers views stretching east to the San Joaquin River Delta west of Stockton and the two main summits of Mt. Diablo rising high to the northwest. In other directions were more gentle, green hills with happy cows chowing down contentedly.